Very nice apartment for what we needed, nice location and very nice area. 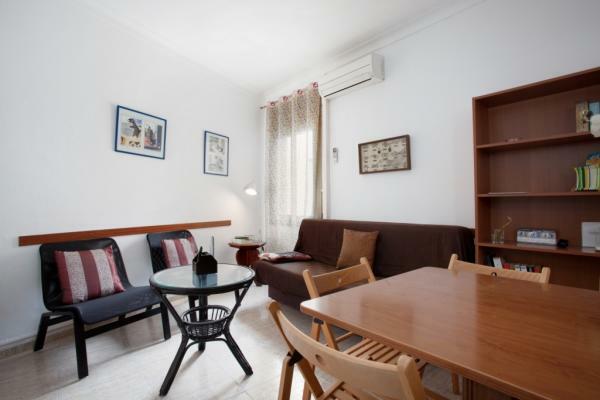 Very quiet apartment, equipped and functional quality. With all the fixtures and fittings, making for a pleasant stay. The Eixample district, one of the most beautiful areas of Barcelona, where you´ll find some of the most renowned restaurants as well as many terraces and shops and unique decoration and high quality. In this part of the Eixample district is mixed. Here you will find the historic building at the University of Barcelona, as the House Modernist samples Golferichs, emblematic of Gaudí houses La Pedrera and Casa Batlló, Parc de Joan Miró, and two large markets, the Ninot and Sant Antoni, which energize and give life to this neighborhood of Eixample. Among the Estació de Sants (Barcelona´s main) and Francesc Macia Square, the most chic district of the city. Also near the Fair and exit south of Barcelona. Very well connected by public transport. Please note: In this apartment check-ins from 8pm to midnight and from 6am to 8am have a supplement of 30 Euro. Check-ins from midnight to 6am have a supplement of 50 Euro. Check-ins on Sundays and public holidays have a supplement of 30 Euro.